I have blogged through the entire Wild Unknown Tarot deck card-by-card! Below, you will find a master list of all posts in this series. I hope this will provide insight as you forge your own bond with this gorgeous, magical pack of cards! In these posts, you will find detailed interpretations of the images and tarot card meanings. As the deck’s box states, there are no rights or wrongs – these are simply my personal interpretations. I’m not affiliated with the Wild Unknown, this series is a purely unofficial labor of love. If you have additional thoughts on the card meanings and images, please do leave a comment! 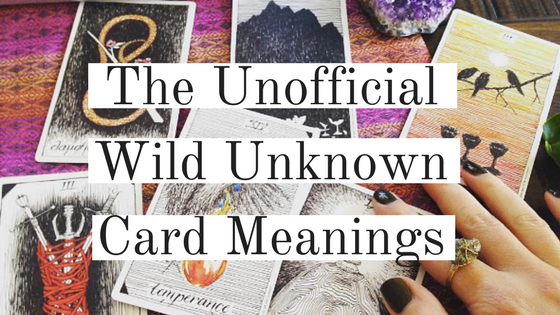 Enhance your tarot studies with a PDF containing every post from this unofficial Wild Unknown card meanings series. …Do you like these posts?! Follow me on Instagram @carriemallon for more tarot content, and sign up for weekly updates below. Hi Moonflower – you make an excellent point, this needs to be updated. I’ll do that now! I’m very pleased to hear that! Thank you so much for blogging your interpretations of these Carrie. They are so helpful. I’m really glad they are helpful! Hi Carmen, thanks! I’m glad you find these helpful. I will be updating again very soon – I hope to have the next two posts up this week. 6th card is the King of Pentacles and using your meaning index of the Wild Unknown Cards, which is not complete. Such suspense….the reading so far has been very insightful, enjoying this deck. Your time is precious I know so I’m not sure what to ask for….do you have the meaning of card online and I haven’t discovered yet? I literally *JUST* posted the Father of Pentacles seconds before I saw your comment. Check the homepage at happyfishtarot.com! I’m absolutely in love with your interpretations, they have been immensely helpful to me in my journey with the Wild Unknown deck. Thank you for taking the time to do each of these! I was wondering, do you think you’d ever post the reversed interpretations of the cards? I feel like you could provide some very decisive insight in that area. Hi Carrie, I just want to say I love your interpretations with this deck of cards, just awesome! I write tarot poetry and only this morning posted my four Tarot queens poems. I have fallen in love with this deck! Excellent series, looking forward to reading more. What an amazing resource for a beginning reader like me! Thank you so much for sharing your work on this. I’ve only just found your website, and this is so helpful! I love how you did the entire deck, and thank you for collecting them all here! I just got my Wild Unknown deck, and I have been looking forward to it for so long. I came across your blog, and I love it. Signed up for your newsletter. And I just wanted to say THANK YOU so much, for this amazing share of your take on this magical deck. It’s just the companion I needed, other than the guidebook, as I form my bond with it. Thank you for your hard work. This is great. I got the Wild Unknown tarot a while ago but it disappeared in my storage box. They came back to me yesterday since I felt strongly to work with them again. I will examine them myself first:-) and then I will examine your amazing resource! This really encourages me to do the same for myself, it shows the process of doing things step by step. Hi 🙂 Are you familiar with a card titled “Birthing Wild”. Itbwas gifted to me and I would like to know more. Hi there! I’ve never heard of that deck, I’m sorry to say! Hi! Wanted to thank you for sharing your thoughts about the Wild Unknown Tarot! It has really helped me! So very kind of you! It even helped to open my own intuition more as to the symbolism and discover some more interpretations of the imagery. I was wondering if you could do the same with the companion Animal Spirit Deck? I have been working with them both together and they are symbiotic! I would really value your insight as to what you see in the symbolism. As someone who is new to Tarot/Oracle and who is also in love with these decks, I find your thoughts to be an invaluable resource. Thanks so much! Hi Iris, I’m so glad you’ve found these posts helpful! Unfortunately I don’t own the Animal Spirit deck, though. Thanks for the reply! I hope you decide to add to your collection! They work well with the Wild Unknown Tarot. I would love to have your insight if you decide to! Thanks again for sharing your thoughts! It’s much appreciated! Did you ever do a blog about your thoughts regarding the use of color in the deck? Such as why she chose magenta in 4 of pentacles? Carrie, could you email me? There’s no contact info that I can find on your page and this concerns a childhood friend you had . Thanks ! Thank you for your beautiful guide to the Wild Unknown meanings. A friend recently gave me a tarot reading using this deck, which I found inspiring and very relevant. It has been wonderful to further explore the cards with help from your interpretations. Thank you for lovely, compassionate site! And Unofficial TWU meanings pdf. I just want to thank you for all of your guides, they are amazingly helpful. I did my first five cards reading earlier today for me and my love one. This is what I got : 1- son of pentacles; 2 – daughter of pentacles; 3 – the sun; 4 – the moon; 5 – the star. Thanks to the book and your blog I can someway understand what they are trying to say but could you please give me a little bit more detail about them? It was my first time after all. Do you have this in pdf format? I just recieved this deck of cards, but no book and I love your interpretations. Plus, rhis deck has 4 extra cards the Daughters cards, which is very new to me.